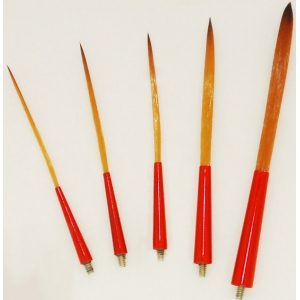 * This extended quill is also made of the same fine Taklon hair as the other brushes in our collection! * This brush comes in 5 different sizes and is made very similar to the Scarlet Fever, except this brush has a blunt end! * Green with Envy is great for lettering as it has a lot of spring. * We've found that some of our product testers have made great use of this brush with its many different painting applications.